Signal disruption within road and rail tunnels can cause serious communication problems for security and emergency services, as well as being inconvenient for mobile phone users. European Antennas has developed a compact, broadband antenna to combat these problems so that system operators have a cost-effective method of transmitting through tunnels. Tunnels are restricted areas where there are few opportunities to mount any type of antenna whether required by police, rescue organisations, private mobile radio (PMR) users, GSM and DCS1800 operators. The new compact broadband antenna covers the entire range from 400MHz to 2GHz with 4 to 7 dBiC gain. This antenna requires a single point installation, and is an effective and low cost alternative to expensive leaky feeders. The antenna is compact, measuring only 420mm diameter. With circular polarisation instead of linear, it has been tested and demonstrated to give a greater signal range in tunnels. To resist the corrosive pollution associated within road and rail tunnels, the antenna has a lightweight plated aluminium housing with rugged, glass fibre radome coated in tough polyurethane paint. 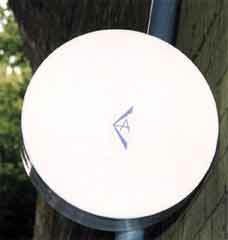 NB - This antenna model was updated in September 2004.